"They say, 'Evil prevails when good men fail to act.' What they ought to say is, 'Evil prevails.'" We're all used to heroes winning out over the bad guys. The bad guys get theirs, justice is done, and the heroes walk away happy. Sometimes things are a little more bittersweet, but we at least expect the villain to lose in the end. One can even get away with a Downer Ending where it ends badly for the heroes, but many of these kinds of endings are "nobody wins" affairs where everybody pays the price (fatally or not). Even if the villain wins in these kinds of endings, it's usually at great enough personal cost to the villain that he or she is utterly ruined as a result. Not so with this ultimate of Downer Endings. The Bad Guy Wins is Exactly What It Says on the Tin: complete and ultimate triumph for the villain, and complete and utter devastation (frequently with death or worse) for the hero or heroes who dared to oppose them. A bad guy who wins is a Karma Houdini by definition, and such endings can frequently be depressing as hell itself — even more so than your regular Downer Ending. 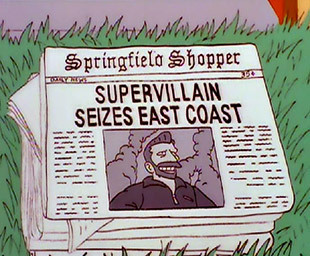 When this trope is parodied, it is the happy ending stuck on for the villain instead which is despairingly from the hero's perspective. History has plenty of examples of this trope, especially in stories of failed rebellions against a powerful empire or recountings of real life tragedies. But in Fictionland, when this kind of ending shows up, it's often used either as a hook for a sequel that will give the hero (or a new hero) the chance to succeed where they failed in the first one, or as a way of showing how much of an utter, hopeless Crapsack World that the characters live in — particularly in the case of Dystopias, where it serves as a warning to those living in the here and now not to let this kind of thing happen for real. There can be any number of other reasons for the bad guy winning: simply for the sake of a twist ending (especially in horror stories, which are often most effective if they leave the audience with a hugely emotionally negative final shock); out of the writer's desire to be original or to throw in a new twist to keep things fresh or unpredictable; because the writer is really pessimistic and/or believes that True Art Is Angsty; because the villain is a Well-Intentioned Extremist and in this case The Extremist Was Right; or just because the writer couldn't find any other way to end the story which suited them. Sometimes it may all just be part of a Black Comedy anyway. Doomed by Canon often requires this trope. If the Big Bad's backstory involves the Big Bad attaining all kinds of success to get him or her into the position that started the story, the Prequel requires them to win — and kill off any major characters, no matter how sympathetic, who do not make it to the original story. More generally, Villain Protagonists will benefit from this trope, particularly in video games where the player takes on the role of a bad guy. Some stories may attempt to use this trope, yet still try to soften the blow. Perhaps the villain's goal is ultimately a good thing. Or the heroes are really Not So Different after all and their loutish behavior keeps us from feeling too sorry for them. Another variant is for the villain to create a Villain World that the heroes must topple in a future story. In cases when the hero was particularly well-liked and/or the villain particularly hated, the audience may call for a sequel in which the villain gets a proper comeuppance. Or lacking that, they may decide to write their own. The sixth form of You Are Too Late is one technique to bring this about. Another technique to invoke this is to form a Xanatos Gambit: the villain wins something regardless of whether the heroes foil their Evil Plan or not. A Last Stand commonly features them. Doing this too often or having this happen almost inevitably will result in Invincible Villain. See also: Downer Ending, Karma Houdini, Industrialized Evil, and Shoot the Shaggy Dog. Dystopias often end this way. Compare Team Rocket Wins, when the bad guys in question are usually so ineffectual the audience may actually be happy for them to catch a break. Contrast The Good Guys Always Win. Can overlap with Godwin's Law of Time Travel. May be considered a form of You Can't Thwart Stage One if it happens in a serial work. Also compare Meaningless Villain Victory, in which The Bad Guy Wins, but the victory is rendered hollow or meaningless or actually becomes a defeat due to some technicality or unforeseen chance. Near-Villain Victory is a typical subversion of the trope in which the bad guy does win for a time, only for the good guys to rebound and take that victory away. Compare Pyrrhic Villainy when the villain's victory came at a great cost. This is NOT necessarily the same with Karma Houdini and Downer Ending, as there are plenty of happy endings where villains escape unscathed and a plenty of Downer Ending s where the villains suffer as much as everyone. If the story lacks a villain, nature (or the heroes' own flaws) might defeat them instead. Note: This is a Spoilered Rotten trope, that means that EVERY SINGLE EXAMPLE on this list is a spoiler by default and most of them will be unmarked. This is your last warning, only proceed if you really believe you can handle this list.